Thoroughbred Software's Hosted Subscription Service takes the high price out of upgrading your accounting software. We host the server, applications software, provide daily backups, perform the necessary maintenance and upgrades to the system and install new releases, all for one low monthly price. Typical IT infrastructure includes the hardware-servers, maintenance contracts, software licenses and software maintenance agreements, and management resource (staff) to maintain the hardware and software. This IT infrastructure can easily push the cost of supporting an in-house system to well over six figures annually. The cost of a Hosted Services data processing model can be a fraction of that. The Server hardware and applications software resides at our Hosting Center, and is always kept up-to-date with the latest operating system, security software and Solution-IV applications. Routine system maintenance functions including upgrades and daily backups become a thing of the past with those functions handled by Thoroughbred's Hosting Center. What you will need is a portal to the Internet with a static IP address, and established internal network. Most of this is probably already in place. We also perform Data Conversion from your existing software, and training services for Solution-IV. 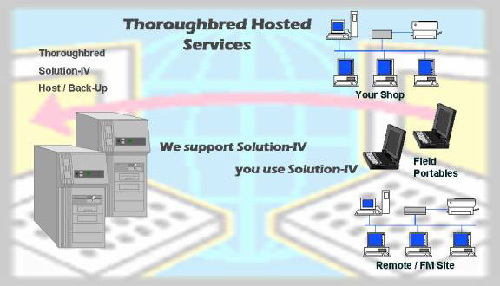 Whether you have 3 users or hundreds of users, Thoroughbred can provide Hosted Services for your business and have you up and running in no time at all. Copyright 2004© Thoroughbred Software International, Inc.